Ham Ninh fishing village is one of the most famous attractions in Phu Quoc that you should visit once in Phu Quoc tour. Despite the development of Phu Quoc, this beauty of this village still keeps intact primitively. Besides that, this village is famous for wonderful beaches and delicious seafood. Ham Ninh is one of the oldest fishing villages in Vietnam. It is located on Phu Quoc island which is less than 20 km from the center of Dong Duong town in the northeast. There are a lot of interesting places around the fishing village that you can experience such as Bai Vong port, and beautiful and peaceful beaches. In the past, the very first settlers were on the way dominating this land exploring this area, they realized this land is very suitable for anchoring the boats, then they decided to set up a fishing village here. The sea area of Ham Ninh is quite shallow, when low tides, it reveals the vast sandy beaches, while high tides, the water rises up till the edge of the forest. The first impression in Ham Ninh village tourists easily explore is admiring Ham Ninh mountain. The stone mountain is about 300 meters high that creates a harmonic scene between majestic mountains and vast blue sky as well as the immense sea. No one knows how long this village has existed, but it is sure that the village was set up when the first residents from other places came here to exploit the seafood and settle here. Under the term of King Minh Mang in the Nguyen dynasty, Ham Ninh eas a hamlet of Phu Quoc in Ha Chau district. Undergone the periods of the Kings Thieu Tri and Tu Duc, Ham Ninh belonged to Kien Giang, followed by Ha Tien and Rach Gia. At the French colonial period, Ham Ninh was a village belonged to Ha Tien district and then moved to Chau Doc district. Ham Ninh fishing village is located on the eastern coast of Phu Quoc island leaning back the mountain and facing to the sea of Thailand Gulf. Standing on the beach of Ham Ninh, you can see Pirate island, Nghe islet, and Ong Hoi headland in the far distance. 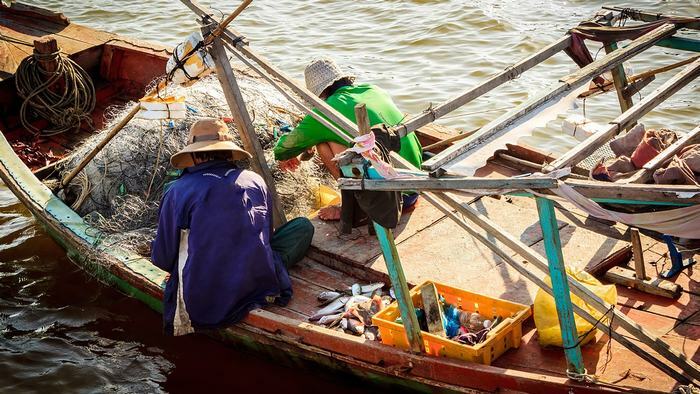 Ham Ninh fishing village is an attractive attraction in Phu Quoc that combines with other places on the island to create a perfect journey in Phu Quoc. It is clear that the village is not only a place to admire the natural beauty of the sky and sea, but also an ideal place to discover the local culture and lifestyle of residents here. 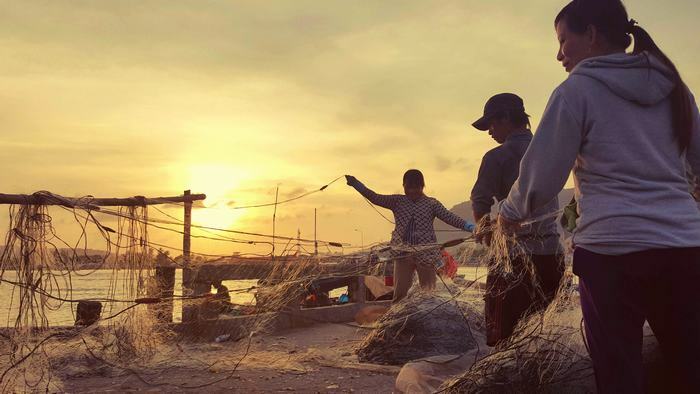 Ham Ninh fishing village give the best impression about its famous landscape and seascape as well as casual people working on the picturesque frame of the bright vivid sunrise and romantic sunset. Ham Ninh village possesses sufficient scenery with majestic limestone mountain, lush green primitive forest, and immense blue sea. In addition to beautiful landscapes, Ham Ninh is known as a traditional village with the hereditary custom of fishing remaining unchanged over years, so there is no lack of fresh seafood in the village with each type of seafood for each season, especially crab. This village is one of the busiest seafood markets that provide cheap and fresh seafood for Phu Quoc island. Most the tourists are eager to visit this village once in their Phu Quoc trip because of its intact natural beauty. Besides the luxury resorts in Phu Quoc, the village is still rustic in the harmony with nature itself. Coming to Ham Ninh, you will be a nostalgic person returning to your hometown. You will be immersed in the daily lives of fishermen who rely on the sea to live. Their jobs are diving for pearls, sea cucumbers, and catching fish. Ham Ninh today is famous for Bai Vong port, and beautiful beaches nearby. Coming to Ham Ninh in the early morning or the late afternoon, the beauty of the village is truly breathtaking. There, tourists can enjoy scenes of the image of the moon floating on the sea surface. Your trip to Phu Quoc will be uncompleted if you have not tasted boiled crabs because it is the specialty of the region. Moreover, you can also have chances to enjoy many kinds of yummy seafood dishes at any time during the year. Visiting Ham Ninh fishing village, you should not miss to buy some crabs in the fishing port and enjoy it while watching the beautiful view of the sea. Ham Ninh village is a beautiful fishing village in Phu Quoc. Let’s come to this village to feel the beauty of nature as well as the fishing culture of local people. If you need further information about the destinations in Phu Quoc, please contact us. Thank you!